The antique french metal bound box has a plethora of interesting features. A label on the inside lid indicates that it was made in Paris by the Bazar du Voyage company. The binding metal on the exterior of the box is intricate and complete. There are decorative cast iron handles on each end, with the intials CM faintly visible. 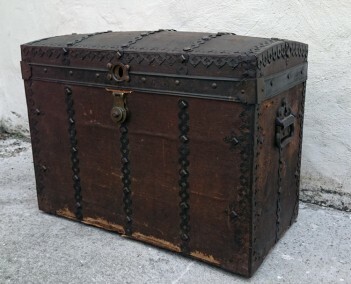 The base of the trunk has two inset casters so the box can be lifted on one end and pulled. This is an interesting and unusal item and for its age its in great condition. 72cm wide by 36cm deep by 56cm tall.